What can I say today y’all, I’ve got me a case of writer’s block, so I’m listening to Depeche Mode and hoping for the best. I guess that’s all you can do some days! Pru mentioned the other day that there’s a 5L going on at the Ostara’s Altar event, and I managed to find a really nice sweatshirt (sized for Maitreya bodies) by one of my fave designers, Secret Oktober. Just find the little egg at their display, pay 5L and this beaut is all yours! Can’t say no to that! Yesterday I mentioned that there are a giant mass of awesome FREE group gifts over at CandyLand that you can pick up by joining the Evil Bunny group for free. I’m showing you the offering by GO, which is this classic red lipstick (it’s a little bit like a light red gloss) that comes with appliers for Catwa and Omega. Cool! Well perhaps my verbose nature will come back to me tomorrow! 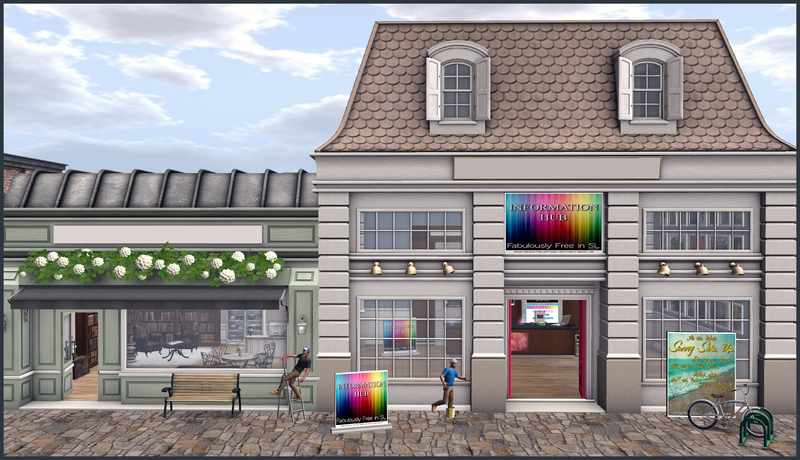 Categories: events, Free, group gifts, hunts, makeup, mesh, shirt | Tags: !gO, Aline Passiflora, Beusy, CandyLand, Euphoric, fab free, fabfree, fabulously free in SL, free, freebie, Glam Affair, JUMO, lelutka, maitreya, Ostara's Altar, Second Life, Second Life Free, Second Life Freebie, secondlife, Secret Oktober, sl, sl fashion, sl free, sl freebie, sl gift, sl style | Permalink. There are days for fancy staid clothing, where you look professional and important. This is clearly not one of those days. It’s a Monday, so I say put aside your normal garb and don something slightly mad and provocative. If you look like a sugar-coated bonbon, there’s clearly no room for the Monday blues! 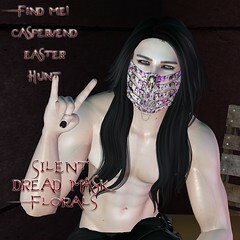 Evil Bunny have got a new event going down right now called CandyLand! Every vendor has a super cute little gift out that you can get for free by joining the Evil Bunny group, which is of course, free to join! Here’s what I’m showing you today! There’s loads more to discover over at CandyLand so hop to it! Categories: dress, events, Free, group gifts, hair, makeup, mesh | Tags: Aline Passiflora, CandyLand, Euphoric, fab free, fabfree, fabulously free in SL, Firelight, Foxcity, free, freebie, Glam Affair, JUMO, Keka, lelutka, maitreya, Second Life, Second Life Free, Second Life Freebie, secondlife, sl, sl fashion, sl free, sl freebie, sl gift, sl style, trs designs | Permalink. Have I mentioned before that I have a fear of lakes? Well if I haven’t, I’m mentioning it now. There’s something sinister about the black depths of a lake, with its slimy greenery and threat of snapping turtles that just gives me the heebie jeebies. However, this pretty little body of water I found at Baja Norte may be just the place for me. Nevertheless, I will pass my time on the dock looking pretty as a picture instead of diving in! There’s a whole lot of awesome over at Designer Circle, so make sure you jump on over there! I may just dip a toe in! Categories: appliers, dress, events, Free, group gifts, makeup, mesh, Nails | Tags: !gO, Aline Passiflora, Baja Norte, empire, Euphoric, fab free, fabfree, fabulously free in SL, free, freebie, Glam Affair, JUMO, lelutka, Magika, maitreya, Pacifica, Second Life, Second Life Free, Second Life Freebie, secondlife, sl, sl fashion, sl free, sl freebie, sl gift, sl style, SlackGirl, West End Poses | Permalink. Hello hello Fab Free’rs! It’s time for another designer of the week post. This one is a little different in that we kind of get a two for one deal! The Mangula and E.Vary brands are created by the same designer. The E.Vary shop offers a range of skins, shapes, and cosmetic enhancements for female avatars along with a few mesh and applier clothing items. The Mangula shop offers unique clothing for female avatars. At both shops you’ll find some great gifts and of course shopping finds. The E.Vary shop is a bright and open shop, where the Mangula shop has a surreal cloud-like atmosphere. Both stores have similar information desk areas with info about the store group, social media, and associated groups and events. 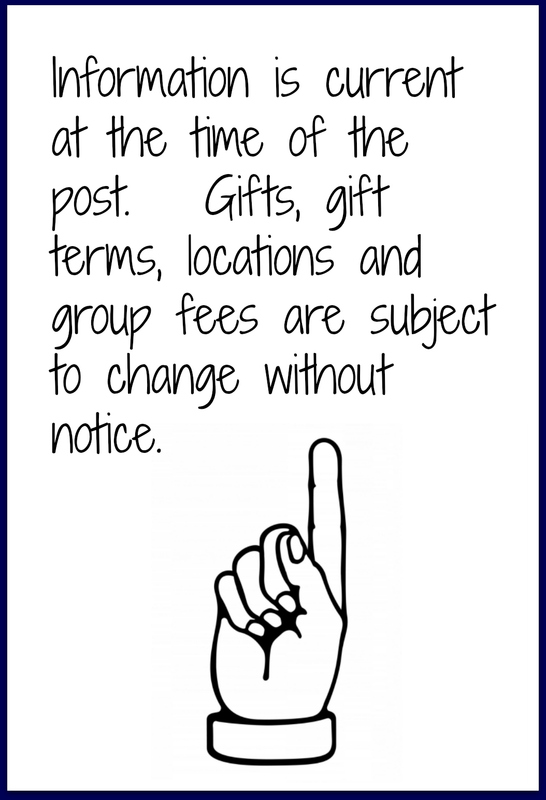 These shops also share an in world group, the * E.Vary * group will get you group gifts and notices for both the shops. 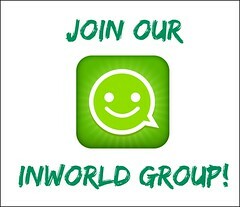 Currently the group is free to join. At the E. Vary shop there are several free group gifts consisting of female skins and cosmetics. You’ll need the group tag for these, however as I mentioned before, the group is free to join at this time. Over at the Mangula shop you’ll find several other group gifts such as the free Fabulously Free group gift. You’ll need your Fab Free group tag to get this cropped top gift at Mangula. The Fab Free group is always free to join. Each of the gifts in this area of the Mangula store require a specific group tag. Finally you’ll see a few gift boxes hanging out with a pair of star balloons. There’s no group needed for these free gifts however you will need to be a member of the store’s subscriber group. Click the gift, wait while it verifies your subscriber status, and once verified your free gift will be sent to you. Each of these freebies also appear to be ladies clothing. 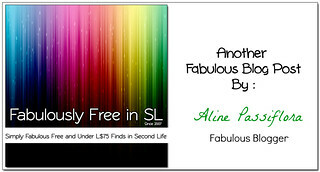 Happy Shopping Fab Free, and I hope you enjoy the up-coming weekend. Categories: appliers, FabFree Group Gifts, FF Designer Of The Day, Free, group gifts, makeup, mesh, shapes, skins, subscribe-o-matic | Tags: Designer of the Week, E. Vary, E.Vary Group Gift, EVary, fab free, Fab Free Designer of the Week, Fab Free in SL, fabfree, fabfree in sl, fabulously free in SL, Fashion Freebie, female fashion, Female Skins, free, free fashion, Free Group Gifts, free group join, free in sl, free skins, freebie, Group Gift Skins, Group Gifts in SL, Mangula, Mangula Fab Free Gift, Mangula Subscriber Gift, Second Life, sl, sl freebie, sl gifts | Permalink. Tis the season of love and it’s all heart eyes and sparkle stickers right now, but there are a whole boatload of people out there who want nothing to do with cupid and his arrows. Perhaps V-day (I shall name the holiday not!) is giving you a hint of the murders right now – if so, have I got the event for you! Well, I’ll try and be proper whilst naming this event, but there really is no way to! 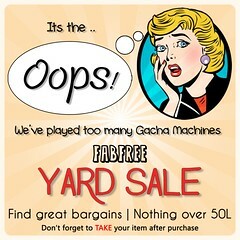 If you love Gachas, but hate getting doubles, then the Gore vs. Whore event is for you! (Phew, I said it!) It’s a gacha-style event with all prizes located in mainstores around the grid. You play the machine, and you won’t get a single repeat! I played the machines over at Sweet Evil and got lots of goodies – my boots, skirt, drink, collar, and lipstick to be exact (though there are a bunch of other prizes to be won too), and then made my way over to Sn@tch to play a bit as well and I got this gory little top that goes with the look perfectly. Each pull is just 25 Lindens! If you’re in the mood for non-repeat gachas, you can read all about Gore vs. Whore right HERE, as well as check out all the prizes available! Just a heads up that this is indeed an adult-themed event! Gore vs. Whore runs until February 23rd! Just behave and don’t get too stabby, ok? Categories: accessories, events, gacha, makeup, mesh, shirt, shoes, skirt | Tags: Aline Passiflora, Euphoric, fab free, fabfree, fabulously free in SL, free, freebie, Glam Affair, Gore vs Whore, House of Shade, JUMO, lelutka, Magika, maitreya, Second Life, Second Life Free, Second Life Freebie, Second Life Syndicate, secondlife, sl, sl fashion, sl free, sl freebie, sl gift, sl style, Sn@tch, Sweet Evil | Permalink. She’s the top of the top, she’s the best, yes! Why yes, yes I am quoting Spice Girls at you. Fight me! Ha! All kidding aside, I’m getting some very vampy and classy vibes in my new outfit! You can grab this look too, just read on my sweets! I hadn’t made my way over to the trusty fishing pond over at Sn@tch for a bit, but I’m really glad I did, because there’s a new fishing outfit available! In order to grab all sorts of goodies, including my hair, necklace, bustier, skirt, and lipstick (and there’s so much more in there too, including goodies for system bodies), all you need to do is dust off your 7 Seas Fishing pole and head on over. Don’t have one yet? Easy peasy, just buy one by the pond at Sn@tch for 100L, and you can fish for all future outfits too! You don’t need any bait to grab all this goodness, just a little bit of patience and time! The bustier comes with an omega applier, as well as system layers, and the lipstick comes in both varieties as well! You can class up any joint with this great look, so head on over to Sn@tch as quick as! Catch you soon, you pretty little things! Categories: accessories, all-in-one outfit, appliers, classic avatar, dress, fishing, hair, jewelry, lingerie, makeup, mesh, skirt | Tags: 7 Seas Fishing, Aline Passiflora, Euphoric, fab free, fabfree, fabulously free in SL, free, freebie, Glam Affair, Happy Dispatch, JUMO, lelutka, maitreya, Saintstreet, Second Life, Second Life Free, Second Life Freebie, secondlife, sl, sl fashion, sl free, sl freebie, sl gift, sl style, Sn@tch | Permalink.